Two Bears Farm and the Three Cubs: Happy Thanksgiving! Wishing all my readers a very happy Thanksgiving today. May it be peaceful and full of tasty foods and quality time with the people you love. A very nice holiday to you also. Happy Thanksgiving to you as well! Have a great day! Happy Thanksgiving to you and I'd welcome that little guy to my table any day1! I actually wonder what is the special occasion of this thanksgiving, but I was not able to move out until I find the answer through using Google search...Now I know that it is very special to you my friend, as per reading, it's about the thanksgiving of a bountiful harvest (and some other good reasons) traced through your treasured history! More power! Now that is a face to be thankful for. He is just too cute for words! Happy Thanksgiving to you, Lisa! oh my gosh, he's cute! I hope you have a wonderful Thanksgiving! We made to Arkansas and the park we are staying in wonderful! All the same to you Lisa!! Happy Thanksgiving. Thank you, Lisa and the same to you. Thank you. You have a wonderful day and enjoy the food! What an adorable picture!!! I'm just catching up with you. I have never had a Chia pet, but I'm thinking the kids would love it? I get those little capsules that you put in water and they turn into an animal sponge. I LOVE your turkey sandwich! And don't get me started on the Natalie Wood thing!! I was a huge fan and am so interested in this case. I wonder why the captain is coming forward now after all this time? Phil jokes that his hush money ran out. And the woman who heard the screaming, she heard it for 25 minutes. If you are drowning, you would be dead after five. Nothing makes sense, but I have always believed there was foul play!!! I hope you and your family have a wonderful Thanksgiving, Lisa! I just saw you message, I see myself on your members, I am a yellow kayaker. How so very cute he is!! Happy Holiday Lisa! Your such a great mom~! 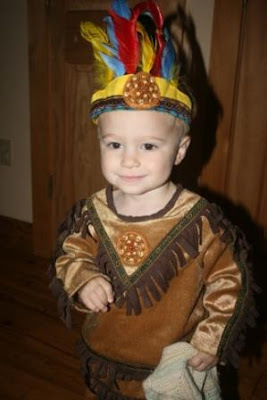 Wonder what his Indian name is? I hope it was awesome for you and your family!